LA Media was delighted to be asked back for series two of The Crown, a widely popular show on Netflix. On season one of The Crown, we were invited out to use our drones to capture upwards of 1000 stills for the visual effects team so that they could recreate a CGI version of the Royal Yacht Britannia for the series. Well, we must have done something right because they were quick to get us back when they were back filming in Scotland. The LA Media team were part of the splinter unit, which sounds pretty ninja eh? We were tasked with using our drones to capture drone tracking shots of moving vehicles and scenic shots of the locations. 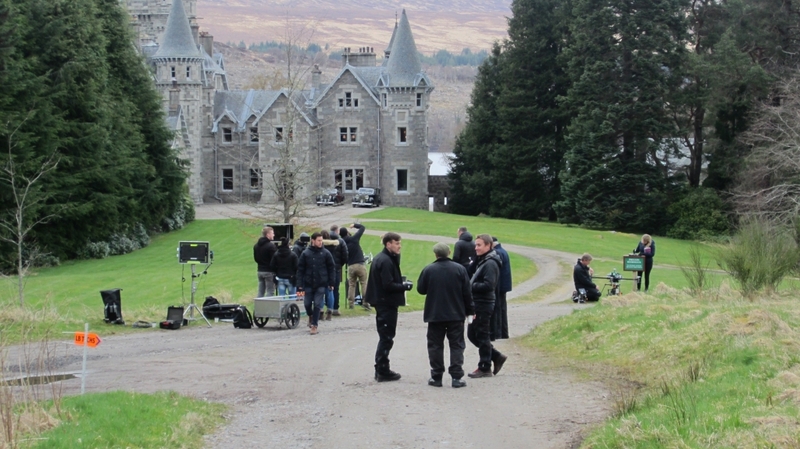 We filmed at Ardverikie Lodge (AKA “Balmoral”) where Her Majesty’s character was staying, played by the talented Claire Foy. Using the drones we also filmed the stunning vintage cars, the rugged Scottish mountains, the lochs, the rivers and anything else that looked stunning and majestic. In Scotland that can be anywhere, you turn – we weren’t short of options. It started as a two-day shoot but ended up turning into a seven-day shoot. The reason for this was the weather! Typical Scotland, snow in April…because that’s normal. The result was that on the first day of filming we were bathed in glorious Scottish sunshine with mild gusting winds. The trick for the sake of continuity was to match that weather and atmosphere at the next location. Mother nature had other plans. We rocked up to the next location (Glen Feshie) to find it shrouded in thick white snow! It wasn’t a gentle powder of snow either – no, it was nine inches of heavy snow. This meant that production had a big decision to make. Do we go back and reshoot the first two days in the snow to make it match? Or do we wait for the snow to melt at Glen Feshie? The final decision by production was to go back to Ardverikie and refilm the scenes in the snow. However, on arrival, the snow was minimal and had thawed within an hour by the rain. This meant the chase was on, going back and forth between the two locations until the snow had melted so much so that we could film at Glen Feshie mostly snow free. On the last day of production, our final drone shot was to be of a grouse hunt over the moors. How posh! This meant there were gun dogs, animal handlers, cast members and blank gunfire on location. This was an expensive scene to shoot and we had to get it right. Makeup, wardrobe, unit techs, film crew and various members of production that included us and our drones had to make it up to the location on a single track road. To say it was busy would be an understatement. The director was pushed for time as he was heading off to catch a plane and we had less than an hour to get the drone shots needed. Like always we rose to the challenge and managed to accomplish these under great pressure. Due to the snow coming off the mountain, the river we’d planned to cross was in full flood. Already, one landrover had been lost to the river! Well, not quite it but it did have to be towed to safety. Going around wasn’t an option and the production needed to reach the other side for a crucial shot. Understandably, we were anxious transporting our electronics and drones across the river. As we talked about before drones and water don’t play well together. Bumps and knocks can prove equally hazardous to a highly sophisticated drone like our Vulcan Raven Heavy Lift. Drones aren’t toys and need to be handled with care unless you want them to have a malfunction. Packed snuggly inside of its custom-made padded box and strapped down we made it across safely and without incident. Crossing a river in full flood was never going to be easy and the moment of truth was on the other side when we successfully flew the drone. This was an amazing production to be part of and we think you will enjoy the footage. As fans of The Crown we are doubly excited, firstly to see our work but second to see what happens this season. How will Phil and Liz cope with parenthood? What is this scandal people have been whispering about? We can’t wait to see more of Claire Foy, John Lithgow and Matt Smith, who are all doing a stellar job so far! We’d like to thank everyone who made this possible and for all the care shown to us by the production team from London.